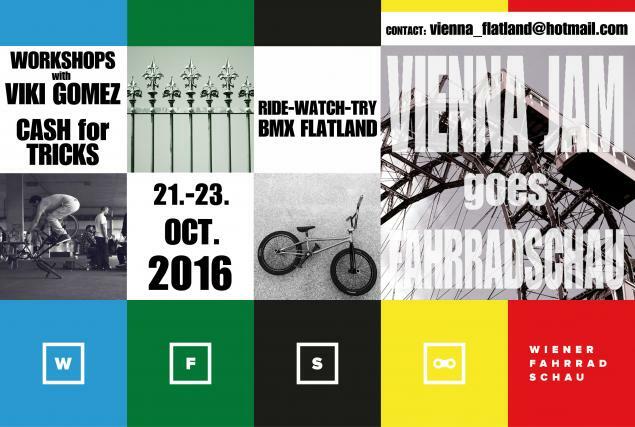 After 6 years meeting at some well known flatland spots in Vienna - 2016 will be different… Vienna Jam goes Fahrradschau. The annual Austrian Flatland Jam will take place during the "Wiener Fahrradschau" bicycle exhibition from 21. -23. of October 2016 at the "Marx Halle" in Vienna. Beside the Flatland Jam and a relaxed "Cash for Tricks Jam" where everybody can take part, you can attend workshops with Viki Gomez and watch the video premiere of his film called "Intrinsic". Throughout the 3 days Sevisual will capture the best moments for a "weekend video" that will be premiered on Sunday afternoon. So book your flight, start your car or hop on a train and ride with us!